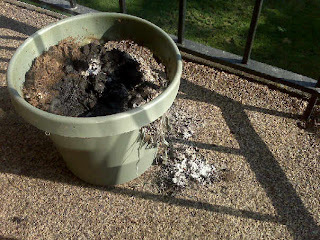 After the Great Artichoke Disaster of 2008 last night, I put the still smoldering hot pot down on a dead planted pot on my balcony. Because my apartment had filled up with smoke, I turned off the a/c and left my balcony doors open for the night. This morning I came out to find my living room seemed to still have a smoky haze going on. I looked on the balcony to see my former planted pot smoking significantly! 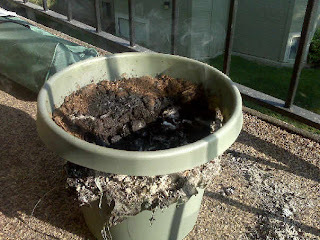 I pulled the melted artichoke pot off of it to discover a mulch fire in progress. Apparently I forgot all those years as a volunteer fire fighter I spent putting out mulch fires. I cannot believe I was so stupid! And now I am at work, paranoid that I smell like a mulch fire. It's going to be a long day. I'm so very sorry to hear about your artichoke fire. But, what did you eat after your great loss? 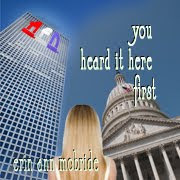 And to think... that you are just recovering from being ill?